Amari Cooper continued to do what has made him a Heisman candidate this season…torch opposing secondaries. That was no surprise as he again did what he does catching 13 passes for 224 yards and 3 touchdowns. Blake Sims was remarkably efficient going 20-27 with 312 yards and 4 TDs although he did have 3 INTs. The major surprise was the Auburn passing game. A team known for their dominant run game lit it up through the air. Nick Marshall went for a career high 456 yards and 3 touchdowns. Sammie Coates averaged 41.2 yards per reception on his way to 206 yards receiving and 2 scores. Duke Williams returned to action and had a major impact as well hauling in 7 grabs for 121 yards. That’s a total of 768 yards through the air in the game. Not the kind of offense you expect in an Iron Bowl but entertaining none the less. If you read the above stud you had to know this was coming. Auburn’s secondary has been bad all year so that was no surprise. Alabama giving up so many was a head scratcher though. Nick Saban prides himself on dominant play in the back end of the defense, but Sammie Coates and Duke Williams were able to torch the secondary all night long. Butker gets the nod as a stud this week. 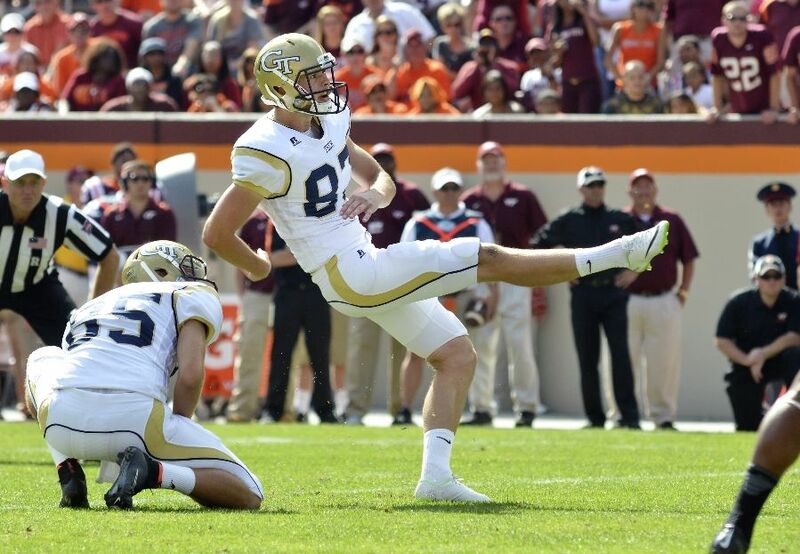 The Yellow Jacket kicker’s previous career long was 49 yards. This game tying field goal was from 53 to send the game into overtime, in what eventually became a win for the Rambling Wreck. Late game plays are always high-pressure moments, but to make a 50+ yard kick, as time expired, against your biggest rival is most definitely stud-worthy. This may have been the craziest game all day. It included a bomb field goal to send it to OT, two blocked field goals and a blocked extra point, AND three fumbles inside the 1-yard line (two by Georgia and one by Tech). Having one fumble inside the 1 is rare, much less three. If any of these teams could hold onto the football, there would have been no drama in the game known as “Clean, Old-fashion Hate”. Elliot put up 121 yards and 2 TDs on 17 carries. Those are good numbers, but normally not stud numbers. The reason he makes the list this week is because quarterback JT Barrett went down with an injury during the game and someone had to step up and make a play. And that is exactly what Elliott did. Late in the 4th, Elliott scampered 44 yards on a 4th and 1 to seal the win for the Buckeyes. Without him, who knows how this one would have ended. Despite a disappointing season according to Longhorn standards, Texas actually had one of the better defenses in the Big 12 entering this game. The Longhorn D was supposed to keep this close until Trevone Boykin and the Horned Frogs would pull away late. That didn’t happen. It was an utter beatdown, 48-10, on the Longhorn’s own field in Austin. If the playoff committee is looking for style points, look no further than what the Horned Frogs did to a stellar Texas D on Thanksgiving night. Normally a Conference USA team wouldn’t be on this list, but they are for one reason. Western Kentucky ruined Marshall’s hopes of making one of the playoff’s New Year’s Day bowls. In a game that looked more like a basketball score, Western Kentucky pulled out a 67-66 win over the Thundering Herd. Doughty had a mind boggling 491 yards passing and 8 touchdowns. Yes 8 touchdowns. It was a monster performance in a game of monster offensive numbers and one that is certainly stud-worthy. It wasn’t so much that Sam picked this game incorrectly. If you look at our record this season you will notice that we do that a lot. It was the line that accompanied his prediction that lands him on the dud list. “Georgia owns Tech. Always has. Always will.” That’s a mighty bold statement and one that came back to bite Ole Pappy in the end. I mean he even sent a tweet out from the 4 Down Territory twitter account (@4_DownTerritory) stating the same thing. If Georgia wins he looks like a genius. If not (like what happened), well…to keep it family friendly, I’ll just say you look like an idiot.